From a sold out 1991 publication of 1000 limited editions. 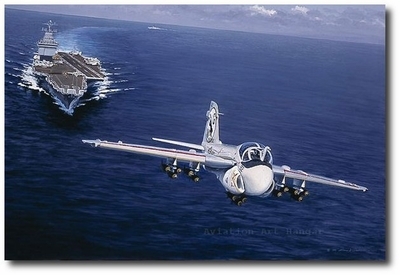 The image is bright and clear: an A-6 Intruder jet aircraft taking off from the deck of USS Enterprise. But the story behind this aviation art is one of consummate courage in the face of incredible adversity, because the pilot is Navy Captain Eugene "Red" McDaniel, the place is the Gulf of Tonkin, and the date is May 19,1967 - ironically Ho Chi Minh's birthday. "The painting occurs at the start of McDaniel's 81st combat mission over Vietnam," explains William S. Phillips. 'at was an Alpha Strike," he continues, "which means a full press. It was on this mission that he was shot down." McDaniel left with twenty-six other Navy aircraft for Van Dien, a truck repair facility in downtown Hanoi. 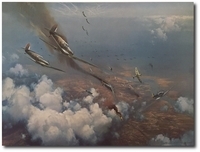 Despite his extensive experience and skill, McDaniel had to bail out after his A-6 was hit by a surface to air missile. "He was captured by the Viet Cong and held in a prisoner of war camp," Phillips says. "What makes him special was how he survived the torture of his captivity." McDaniel was held for six years. And during that time, he displayed a courage and bravery in the face of physical and mental torment that elicited the admiration and respect of everyone who believed in freedom. That freedom was finally returned to him. His convictions had been tested, but "Red" McDaniel emerged victorious. When he returned home, he was awarded the Navy's highest award for bravery, the Navy Cross. Among his other military decorations are two Silver Stars, three Bronze Stars and two Purple Hearts for wounds received at the hands of his torturers. Captain McDaniel resumed active duty as Commanding Officer of the USS "Niagara Falls" and Commanding Officer of the USS "Lexington" aircraft carriers. He then served as Director of Navy/Marine Corps Liaison to the U. S. House of Representatives from 1979 to 1981. He retired from the Navy in 1982.